The previously rumored Pentax K-5 Silver, 645 25mm f/4 lens and Optio WG-1 got released today. The only still missing camera is the Pentax RZ-18 Optio. 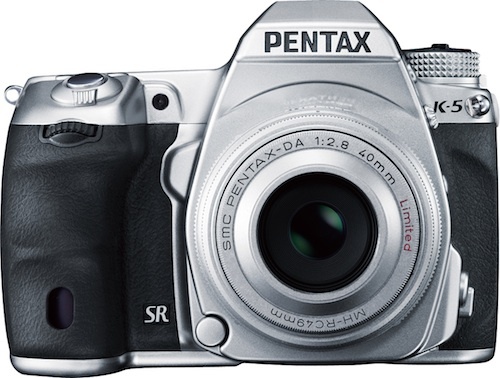 Golden, Colorado (February 7, 2011)…PENTAX Imaging Company has announced that the popular K-5 digital SLR will be available soon in Limited Edition Silver. Available in the US in limited quantities this special-edition model of the PENTAX K-5 digital SLR camera will feature an exclusive design with an original exterior color scheme and a uniquely shaped grip. Along with the silver K-5, PENTAX announced three popular PENTAX DA Limited Edition Silver lens models designed for use with PENTAX digital SLR cameras also which will ship in the near future. Each limited edition lens will feature a high-quality, silver finish applied to the high precision machine shaped lens barrel, hood and cap. The special edition, silver finish K-5 will match existing PENTAX FA-Limited series lenses and the new DA Limited Silver series lenses. The camera’s mode dial, control buttons and levers all feature the elegant silver color. To improve handling, this special-edition model comes with an exclusively designed grip that is thicker than the standard K-5 model. Shock-resistant, scratchproof reinforced glass has been used to protect the LCD monitor on the camera’s back panel and the status panel on the top panel. • High resolution 16.3 megapixel CMOS sensor. • Fast 7 FPS to capture fast action shots. • A high sensitivity 80-12800 ISO range, expandable to 51200, with improved noise performance overall. • Widescreen 1080p HD video at 25 FPS with sound via built-in microphone or external 3.5mm stereo microphone jack. The unique DA Limited series of prime lenses offers incredible sharpness and image quality, and are made specifically for PENTAX DSLR cameras. These lenses are ideal for even the most discerning photographer who demands top performance in an ultra-compact package. The high-grade aluminum construction of the DA Limited series provides the utmost durability and elegant design. Whether paired or purchased separately, the Limited Edition Silver K-5 and the smc PENTAX DA Limited Silver lenses will offer owners a classic, high-end photography expererience. 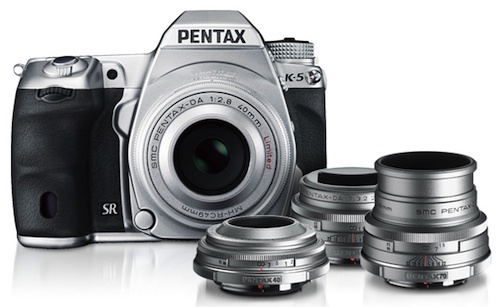 Priced at $1699.95 (body kit), the PENTAX K-5 Limited Edition Silver will be available in April 2011. The PENTAX DA Limited Edition Silver lens pricing and availability are TBA. 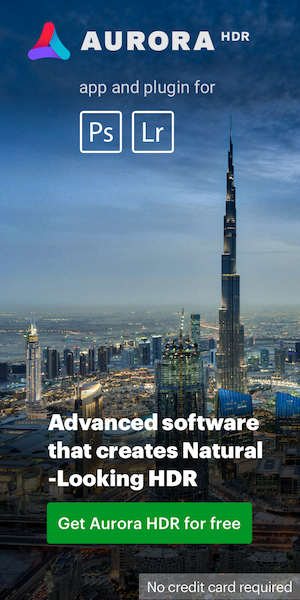 PENTAX Imaging Company is an innovative leader in the production of a variety of digital cameras including weather-resistant digital SLRs and stylish, compact, waterproof cameras, as well as lenses, flash units, binoculars, scopes, and eyepieces. For more than 90 years, PENTAX has developed durable, reliable products that meet the needs of consumers and businesses. With headquarters in Golden, Colorado. 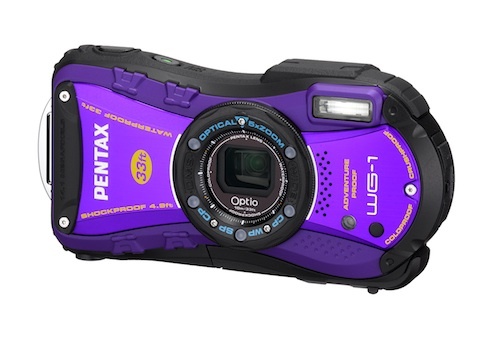 PENTAX Imaging Company is a division of PENTAX of America, Inc.
February 7, 2011(GOLDEN,CO)…PENTAX Imaging Company has announced its 12th generation of adventure series digital cameras – the PENTAX Optio WG-1 and PENTAX Optio WG-1 GPS. Featuring outstanding waterproof, dustproof, shockproof, coldproof, and crushproof capability, these extra-rugged models take adventure photography to new heights (and depths). • Waterproof to 33 feet. • Shockproof, ruggedized design to withstand falls up to 5 feet. • New crushproof construction* to withstand weight force up to 220 pounds (100kgf kilogram-force). • Enhanced Digital Microscope mode that offers five macro LEDs for excellent macro lighting plus a detachable macro stand for steadier capture. • Fast Face Detection technology, Smile Capture, and Blink Detection for portraits including a handy new Self-Portrait Assist mode perfect for facebooking and other social networking activities. • Available with and without GPS, the WG-1 GPS functionality* tracks and records positional data recording with images for geo-tagging applications making it easy for users to check the shooting locations of captured images and link the data with PC-based maps. *Measured under PENTAX-original testing standards. ** GPS included only on the select WG-1 GPS model. • Coldproof to sub-freezing temps of minus 10 degrees C (14 degrees F). • Dustproof protection for dry, dusty environments. • Wide angle 5X internal optical zoom lens (28-140mm equivalent). • Large 2.7 inch LCD features a wide angle 16:9 aspect ratio with anti-reflective coating. • Video capture in widescreen 720p HD at 30 frames per second. • Pixel Track and Digital Shake Reduction ensure sharp, blur-free images. • An autofocus assist lamp helps to quickly and accurately focus, even in challenging lighting. • An HDMI port to play back beautiful, high definition images and video on HDTVs. • Infrared remote control compatibility with the waterproof Remote Control WP, as well as other PENTAX infrared remotes. • Designed with the look of mountaineering equipment, the new Optios includes a woven web fabric strap in complementary color accents complete with a carabiner to attach the camera to a backpack and other outdoor gear. Priced at $349.95 USD, Optio WG-1 will be available in a choice of Black or Purple, while the Optio WG-1 GPS will be priced at $399.95 USD and available in Black or Yellow Green. Both cameras will ship in April 2011. A waterproof infared remote control (sold separately) for use with the PENTAX Optio WG-1 and other infrared compatible Optio models is available now for $29.95 USD. GOLDEN, CO (February 7, 2011)…PENTAX Imaging Company announced the addition of a second lens for the 645D Medium Format digital camera. As the second model of the 645D lens series, the smc PENTAX D FA 645 25mm F4 AL [IF] SDM AW is designed as an ultra-wide-angle lens that features PENTAX-original optics optimized for high-quality digital photography to assure exceptional image- performance as well as dependable dustproof, weather-resistant construction for active outdoor photographers. Offering a focal length of approximately 19.5mm in the 35mm format (or approximately 15.5mm when mounted on a PENTAX 645-format film SLR camera body), this new lens provides the widest perspective of all PENTAX 645 lenses. Creating visual effects unique to ultra-wide-angle lenses — such as exaggerated perspective and enhanced depth of field — this lens may be used for a wide range of subjects including spectacular landscapes and indoor shooting in confined spaces. 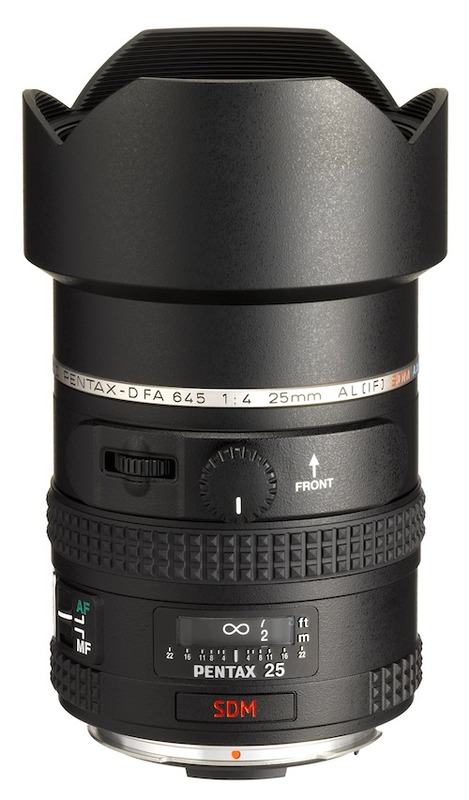 Priced at $4999.95 USD, the smc PENTAX D FA 645 25mm F4 AL [IF] SDM AW lens will become available in April 2011. Incorporating two high-performance aspherical optical elements in its optics, this ultra-wide-angle lens provides exceptional images with outstanding brightness levels even at the edges while compensating various aberrations to a minimum. Exclusive lens coatings are applied to optical elements, while anti-reflection materials are applied to the interior of the lens barrel. The results help maximize the potential of the PENTAX 645D medium-format digital SLR camera. This lens is treated with PENTAX-original Aero Bright Coating to deliver higher quality images. As the newest model of the dependable All Weather (AW) series, the lens features a highly dependable dustproof, weather-resistant construction with 11 special seals to effectively prevent the intrusion of dust and water into the lens interior. Used with the PENTAX 645D camera body, the lens offers a durable, reliable digital imaging that performs superbly in demanding outdoor settings including rain, mist, or locations prone to water splashing or spray. The lens features a built-in, pull-out-type filter holder in its barrel. By placing the C-PL (circular polarizing) filter (40.5mm in diameter and included as an exclusive accessory) on this holder, the user can easily rotate the filter to obtain the desired polarizing effect. * Manual-focus operation only when the lens is mounted on the PENTAX 645N or PENTAX 645N II camera body. This entry was posted in Pentax and tagged Pentax K-5. Bookmark the permalink. Trackbacks are closed, but you can post a comment.